John Redondo Halliday was a professor of music theory and director of college choirs and bands. He was a member of The Church of Jesus Christ of Latter-day Saints. Halliday was born on September 8, 1911, in Redondo Beach, California, and lived in Pleasant Grove, Utah, where he began to study piano, clarinet, and voice. He went on to earn his bachelor’s degree in music and master’s degree from Brigham Young University. He completed his PhD in music theory from the Eastman School of Music, the first given in the United States. He taught at the Eastman School of Music while doing graduate work. He studied with the Boston Symphony Orchestra and Paul Hindemith. He also spent two years studying in France and Italy. 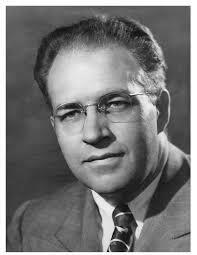 In 1937, he served as the assistant conductor of the Mormon Tabernacle Choir. Halliday was the vice president of the College Band Director’s National Association and was a president of the Utah Academy of Sciences, Arts, and Letters. He was a faculty member at BYU for more than thirty years where he was director of bands and professor of honors music theory. He founded the BYU Oratorio Choir and served as the dean of the College of Fine Arts from 1947 through 1948, when he was appointed the chair of the Department of Music. In 1975 he was honored with the Distinguished Service Award from BYU. He retired a year later. He and his wife, Flora, were the parents of four children. He died in 1988. This page was last edited on 1 May 2016, at 23:40.